New York, N.Y., U.S.A. : Viking, 1985, c1984. 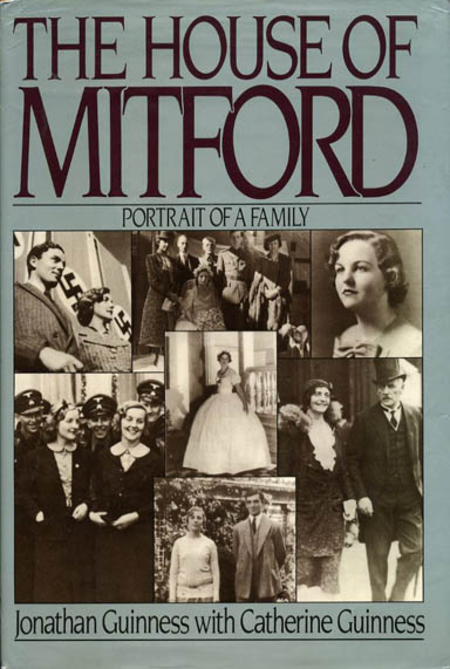 The story of one of the 20th century's most extraordinary - and controversial - families, the Mitfords. They were glamorous and romantic and - especially in politics - extreme. Yet the flamboyant contrasts and the violent disagreements hid a powerful affection, subtle likeness in character, and an underlying unity. Jonathan Guinness is Mitford Sister Diana's oldest son, so he has the inside track on all things Mitford. The House of Mitford is a fairly comprehensive biography of the family, beginning with the grandfathers and the parents for a couple of hundred pages before arriving at the sisters. These were all very interesting people, and tracing family traits through three generations is a captivating process. The most of the book, however, deals with the six sisters, Nancy, Pam, Diana, Unity, Jessica, and Deborah. A brother, Tom, was killed in 1945. Guinness has less to say about Pam, Jessica and Deborah because Pam was the "dull" one of the bunch, Jessica refused to talk to him when he was preparing the book, and Deborah was the youngest and not really in the picture for the drama of the war years. He spends the most time writing about his own mother and her partner in Fascism, Unity. I would not call his commentary "apology" exactly. He acknowledges that Hitler and his followers committed atrocities, but he also goes to some lengths to show that Diana and Unity did not see this side of the man. I confess to being chilled as I read about Diana and Mosley's visits after WWII to "the respectable remnants of European Fascism," including Peron (not European, but still...) and Franco's brother-in-law. In fact, to one accustomed to think of Sir Oswald Mosley as a jerk of the first order (thanks mainly to P.G. Wodehouse's fictionalized treatment of him), the respectful tenor of remarks about the Fascist and Nazi elite with whom Diana and Unity socialized is jarring. However kindly he paints her, Unity comes across as practically certifiable even before her suicide attempt, and Diana not much more balanced.